Sixteen-year-old Graceland Holloway doesn’t believe in perfect love, or love at all thanks to her mother. But she does believe in perfect memories. When her oldest brother leaves the Holloway farm, Gracie meets the gorgeous new farm hand, eighteen-year-old Bentley McKinna. Bentley knows it’s all a game he can’t afford to play. But there’s only so much a guy can take… especially from someone like Gracie. There’s something about a sleeping person that shows you who they really are. Like the body is so in need of rest that it peels away all the layers we build around ourselves to work on strengthening who we are instead of who we pretend to be. The way Gracie curls herself as small as she can, hides her face in her arms, and clutches the hem of my T-shirt as she sleeps, shows me more about what she’s hiding from than anything she could ever say. Sybella arrives at the convent’s doorstep half mad with grief and despair. Those that serve Death are only too happy to offer her refuge—but at a price. The convent views Sybella, naturally skilled in the arts of both death and seduction, as one of their most dangerous weapons. But those assassin’s skills are little comfort when the convent returns her to a life that nearly drove her mad. And while Sybella is a weapon of justice wrought by the god of Death himself, He must give her a reason to live. 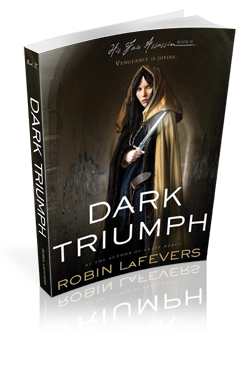 When she discovers an unexpected ally imprisoned in the dungeons, will a daughter of Death find something other than vengeance to live for? Of all the things he could have said, that is the one thing that comforts me the most. “Nor I you,” I say around a strange lump that has formed in my throat. LOVE that teaser from Under the Dusty Sky! I’ve always had similar thoughts about sleeping people. It seems so intimate, watching someone sleep, doesn’t it? 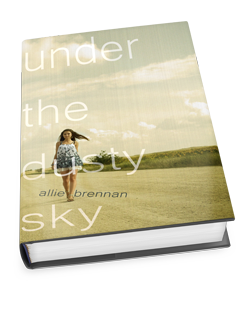 Such a cute teaser for Under the Dusty Sky! I also love the teasers for Dark Triumph. Thanks for stopping by my blog! New follower! Great teasers! I’ve got two this week, you can find them here.